I am so excited today because we have one of the top personal stylist in the country, Malia Anderson, on the blog today talking about some great suggestions for New Years Eve fashions. She is going to share some of her favorite styling tips to have all my gorgeous plus size brides out there looking amazing during the holidays.. Living in wine country CA a lot of events are held outside in wineries even in the winter so that means shoes need to have a sturdier heel do deal with outside terrain. If the party is held in a hotel ballroom your shoe options are not as big of a concern. There are some simple rules to making sure you are not underdressed. Understand the words. Make sure your outfits going to get you thru the night right to the end we don’t want to be Cinderella. NYE is not the night to wear new shoes for the first time or to give that corset a try. These are things that will ruin your night. Make sure you have test drove your NYE outfit for a few hours before the night arrives so that you have time to make adjustments. Now that we know the location, the dress code, and the time now we get dressed. As a wardrobe stylist I work very hard to make sure all of my clients understand their personal style so that when I shop with them or for them that they can see themselves in the clothing I chose. Style by Malia’s philosophy on personal style is very simple “Style for your body, budget, and lifestyle” I make sure I follow that whenever I am choosing outfits for clients. I like to mix materials and styles to get to the best looks. For NYE I breakdown the looks into dress code categories first, and then into personal style options. This is where my event wardrobe lives most days and I think it is the best place to have fun with a look it is also the hardest place to be underdressed. Honestly this is my least favorite place to get dressed as I tend to feel overdressed. However it is the most budget friendly and can most of the time be the most comfortable. I love a good staple and when I build client wardrobes accessories are a shopping a day all their own. Keep in mind with formal it is usually about the dress so I keep shoes and bags less dramatic. With cocktail attire I feel like anything goes so I get playful with shoes and sometimes add an unexpected touch like a bootie. With casual if you are doing jeans then I think the accessories need to be over the top drama otherwise it is an outfit you would where on any random Tuesday. Makeup and Nails, as a wardrobe stylist I tell my clients to consult an expert. For nights like NYE I head to my favorite local makeup artist and let her play. I make sure she knows what the dress looks like and what I am going for as an overall look then I let her do her thing. I have yet to be disappointed and it takes the stress off me for the night. I will issue this warning never get anything waxed on the night of a big event and always make an appointment. The best advice I can give is to just have fun. Forget the resolutions and celebrate all that has happened in 2015 and then prepare to rock 2016. 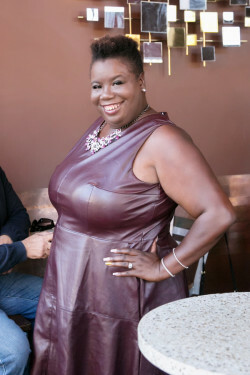 Malia Anderson is a personal stylist, public speaker, and fashion editor in the San Francisco Bay Area. Malia has spent almost twenty years in the fashion industry honing her skill as a personal stylist. Anderson understands fashion from all of its different angles, from production of fashion shows for a range of designer, to her styling of the San Francisco elite. Her company, Style By Malia, is the realization of Anderson’s childhood dream. Malia was once a girl who fell in love with the pages of fashion magazines, now Malia acts as a fashion editor herself for the North Bay Women’s Magazine. Malia Anderson’s business, Style by Malia has grown from dreams of a little girl to become one of San Francisco’s largest and most established personal styling services. Malia caters to client of every lifestyle, shape and size. Style by Malia works with companies throughout the North Bay to establish company looks, as well as works as a style expert and contributor to North Bay Blogs, North Bay Women Magazine and the Marin Independent Joural. Malia Anderson works to inspire female business owners and the busy CEOs of Sonoma County to live more empowered lives by looking, and feeling, their best.